WARSAW — Friday, May 20 is National Bike to Work Day and also the start of the Fat and Skinny Tire Fest activities in Warsaw. To celebrate the big day, Bike Walk Warsaw held a Bicycle Pedestrian Summit at Mad Anthony’s. 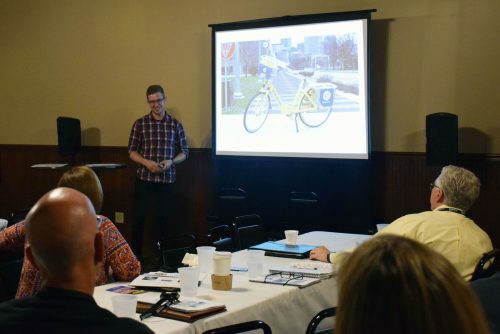 The summit included presentations from bicycle experts who are local and around other parts of Indiana. Each presentation had the same goal of creating a healthier, more desirable place to work, play and live. Pete Fritz, healthy communities planner of the Indiana State Dept. of Health, came to the summit to talk about bike commuting in the workplace. Fritz mentioned that the Warsaw, Winona Lake area already has six Bike Friendly Businesses including: DePuy Orthopaedics, Cerulean Restaurant, Green Earth Multi-Sport, Kosciusko REMC, SYM Financial Advisors and Trail House Village Bicycles. Caitlin Stevens, regional planner of Michiana Area Council of Governments, spoke at the summit about the Active Transportation Program. The plan targets St. Joseph, Elkhart, Marshall and Kosciusko counties and identifies the needs, resources and strategies necessary for increasing active transportation. The plan began last September with a survey to determine where the counties were with their existing active transportation. According to the survey, 86 percent believed that it was important to have access to safe and convenient bicycle and pedestrian routes and 56 percent were very interested in biking more for transportation. Based on the survey results, the Michiana Area Council of Governments will start to fill in the gaps in active transportation that were recognized and move the counties toward more active lifestyles. Another big presentation was given by Tim Dombrosky, assistant city planner of Warsaw. Dombrosky spoke of Warsaw’s recent nominee as a finalist for a Stellar Community. To celebrate being a finalist, the city of Warsaw will be having a community block party during July’s First Friday. Warsaw must beat either Shelbyville or Rushville to be named a Stellar Community and receive $6.5 million for improving the community. Judges will be visiting Warsaw on July 21 and the winners will be selected on Aug. 18. If selected, Warsaw will see four years of large projects being completed between the downtown area and Winona Lake. “Our overall goal is improving the quality of life,” said Dombrosky. Craig Allebach, Winona Lake town manager, presented progress on the Bicycle and Pedestrian Master Plan Progress. The future plans include the roundabout planned for Argonne Road, a new park, Rotary Park built on West Center Street, finishing the Husky Trail by Harrison Elementary School and many other bike-friendly projects. “All we are doing with ride/walk is trying to get people off the roads where they are competing with cars,” said Allebach. Also in attendance, was Warsaw native Dan Remington who serves as the customer service manager for the Indianapolis Cultural Trail. He came to the summit to share Indianapolis’ success with their Cultural Trail and bike share program. “This is the best weekend in Warsaw and I will be staying through the weekend,” said Remington in reference to the Fat and Skinny Tire Festival. Rob Parker, president and CEO of Kosciusko Chamber of Commerce, was the last person to present at the summit. He wanted to stress that the installment of future walking and biking trails means more business for the community. If any businesses are interested in becoming a Bicycle Friendly Business, the next deadline to apply in June 30. Parker ended the presentation by asking that everyone in the community find give some of their time, talent or treasure to future projects of Warsaw. “All of us have one of these things that we can donate to the cause,” said Parker. “We can use your help to make our community better. Warsaw’s Bicycle Friendly Community status will be expiring at the end of 2016. The town plans of reapplying and hopes to improve on their current bronze status.